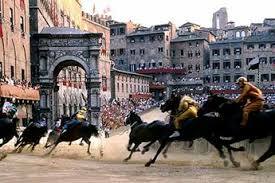 Siena, Italy: the magical city of medieval towers, pigeons, and a suicidal horse race called the Palio. If you want to test your fear of mobs, hang around after the race with the demented men from the losing contrada, one of seventeen Sienese districts dating back to the Middle Ages. You will witness grown men crying and screaming for each other’s blood. Your only refuge may be the contrada’s baptismal fount or chapel where the horse is blessed before the race. The flag-tossing and pageantry before the race makes it all worth it, as does the enchanting Piazza del Campo in the heart of the city, where cars are not allowed and tourists lounge on the pavement. I first visited Siena, my favorite city on earth, as an archaeology graduate student in 1975; I returned there for a conference in 2008. While soaking up atmosphere and taking pictures for my next book, I was amused to discover the old sign over the entrance of our conference venue: “ospedale psichiatrico,” or insane asylum. A perfect place for passionate and peculiar academics to meet! 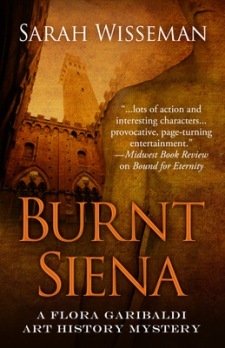 Both the Palio and the insane asylum made it into my novel, Burnt Siena (Five Star/ Cengage, June 2015). The mystery stars Flora Garibaldi, a half-Italian art conservator who discovers that her job with the Lorenzettis, a renowned family of painters in Siena, is not at all the advanced practice in paintings conservation she expected. Her employers supplement their legitimate income from restoring Old Master paintings with forgery and smuggling antiquities. After her good friend and colleague is murdered, Flora must juggle the demands of her irascible boss and a young policeman, Vittorio Bernini, who is less interested in in solving the murder than he is in getting to know Flora. The next Flora Garibaldi Art History Mystery will take place in the catacombs of Rome, where the Carabinieri’s Art Squad leads an international team in the search for Nazi-looted art. 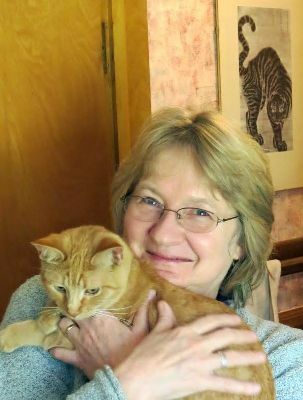 Sarah Wisseman, a retired archaeologist at the University of Illinois, is the author of four Lisa Donahue Archaeological Mysteries set in Boston (Bound for Eternity and The Fall of Augustus) and the Middle East (The Dead Sea Codex and The House of the Sphinx) and one stand-alone historical mystery (The Bootlegger’s Nephew) set in Prohibition-era Illinois. Learn more about Sarah and her novels sarahwisseman.com. She can also be found on Facebook, Twitter, and Goodreads.